As his new memoir pulls back the curtain on the mysteries of the Fed, Alan Greenspan spoke to Fortune's Andy Serwer about market mayhem, housing prices, and his new critics. 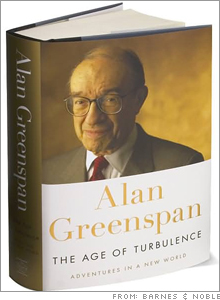 (Fortune Magazine) -- Alan Greenspan's memoir arrives with remarkable timing for two reasons. One is that at a time like this, with financial markets in upheaval, we yearn for guidance from the oracle who presided over 18 years of relative peace and prosperity in the U.S. economy. 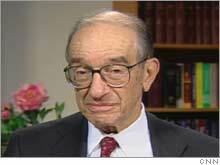 The second is that a wave of revisionist thinking holds that the reign of Greenspan may not have been so great after all, that he bears some responsibility for the twin bubbles of dot-com mania and the recently deflated housing boom. Greenspan's memoir goes on sale Monday. In The Age of Turbulence (The Penguin Press, 505 pages), Greenspan gives his side of the financial saga, holding forth with his trademark wonky curiosity about statistics and the appreciation of human nature that he learned from author Ayn Rand (see Daniel Okrent's review). In an interview with Fortune managing editor Andy Serwer, the legendary Fed chief gives an up-to-the-minute diagnosis of the financial situation, his outlook on housing prices, a prescription for the coming Medicare crisis, and his take on the Bush administration's virtues and vices (read the full interview). What's going on in the capital markets and the housing sector? Could you explain it to us, please? This was an accident waiting to happen. If it weren't subprime, it would have been something else. We have been through this type of event innumerable times over the centuries. We get to a state of extraordinary exuberance which, when confronted with reality, turns to unrelenting fear, huge withdrawals, extraordinarily little liquidity, and considerable credit fears. We know where it's going. We just don't know the actual, specific resolution. We have never had the capacity to defuse a bubble, and I suspect the reason is that until we essentially reach the climax of euphoria, the speculative fever doesn't break. But when it does, it turns on a dime. How bad is it going to get? Is it going to cause a recession? We do know that the housing market has a significant way to go on the downside. The real issue is whether house-price declines spill over into consumer expenditures, as they did on the upside, and cause the economy to shrink. That we're slowing down significantly is unquestionably the case. Whether it actually tilts into a meaningful decline is still on the table. How would you judge chairman Ben Bernanke's response so far? I think it's been a very sensible one, because the board is confronted with something I was not confronted with, namely, evidence of finally coming out of this disinflationary trend. Cost pressures are beginning to build around the world. This suggests that, longer term, the Fed's going to have to be tighter. It means that stock prices are going to have some difficulty moving forward. Shorter term, clearly, it's got problems with very significant credit disruptions and turmoil. [In my tenure] we had a relatively easy task in lowering rates without concern about triggering inflation. I regret that that is no longer the case. Now, of course, people are pointing fingers at you, saying you're at least partly responsible for the housing bubble because of what you said in 2004 about adjustable-rate mortgages being prudent. How do you respond to those critics? I think revisionist history is coming on with a rush. Remember, subprimes were not on the horizon. They were there, but they were very small. The speech I made actually referred to a Fed study that had demonstrated that the [cost of the] insurance you're getting to have a fixed-rate mortgage was very high, and that a number of people would do far better with ARMs. A week later I said that I may have not made it clear that what I was focusing on was a very small segment; I just gave you the pros and cons. Indeed, those who took out ARMs within the next few weeks after I made both of those statements, had they refinanced into fixed-rate, 30-year mortgages 18 months later, would have come out way ahead. So the bottom line is, take your choices, but I would have written the same speech I did in 2004.
Who's to blame for this mess? How do you reconcile the fact that some people - namely, Bob Woodward - call you Maestro, and then there are people out there pointing fingers at you because of the housing problem or blaming you for the bubble of 2000, calling you Mr. Easy Money Fed Chairman. Which one is it? It's neither. I think I got undue praise for what was essentially the inevitable consequence of the fall of the Soviet Union, which was obviously a seminal geopolitical event but was also a very important economic event. Prior to the fall of the Berlin Wall, we had two competing economic systems - central planning and market economies - and they would vie with each other. It was not clear which had the winning side. When the Berlin Wall came down, and we really looked at what amounted to an economic experiment in Germany, where two countries [had] an identical history, the same culture, it was remarkable. East Germany, which had been expected to have the average standard of living of about 75% of West Germany, indeed had half that. And the shock was so great in the Third World, which had been playing with central planning, that without any fanfare, the shift toward market economy, especially in China, created a huge change in the world economy. It went into a seriously impressive disinflation, which brought all interest rates down, made a huge boom in the economy, a huge increase in assets. And when lots of people would come up to me and say, "Thank you for my 401(k)," I was embarrassed, because I had nothing [to do with it]. I do grant that the Federal Reserve understood largely what was going on, and I think we calibrated monetary policy to fit the circumstances. We realized that bubbles will not run out until they essentially come to an end - you can't stop them prematurely. But what we can do, and did do, is make sure that the economy was sufficiently flexible and that the decline was absorbed in a sufficiently liquid environment. And the recession that occurred subsequent to the dot-com boom is now very difficult to find in the revised data. In other words, we had a terrible decline in stock prices, lots of people lost huge amounts of money, but not many people lost their jobs. You served many Presidents. Who's your favorite? Did he have the intellectual firepower to be President? Yes, he did. He was not as smart as Nixon or Clinton, but I think there was enough to make up for that, which made him an extraordinary man. Your relationship with both Bushes was strained at times. The elder Bush blamed you in part for his defeat. I wouldn't cut rates sufficiently, quickly. Actually George W. Bush was very cognizant of the importance of having an independent Federal Reserve. Never did he in any way second-guess the Federal Reserve. I very much appreciated that. Where I had difficulties were on the fiscal side. We had a situation where the Republican Party had the presidency and both houses of Congress and the surplus. And I said, "Nirvana." We dissipated it. In the election of 2006 the Republicans deserved to lose, and the reason is that they had originally come to office with major policy initiatives, and they went out of office solely seeking power, and in the end they achieved neither. And I find that very saddening. What should we be worried about most right now in terms of the economy? Strangely enough, I think it's politics. We have a dysfunctional political system in the sense that there are very serious fiscal problems out there, most importantly Medicare. As best I can judge, when the baby boom retires, we are going to have to either raise taxes very sharply or cut benefits by half. No politician wants to confront this. And this is a very sad event because what's at stake here is the fiscal stability of the American government. How will it be resolved ultimately? Probably the least politically difficult is essentially to make it akin to a welfare program, but those who are supporting social insurance think that is anathema. The problem is that the arithmetic is inexorable here. I don't see how you get around that. Prudent policy would be to adjust the longer term now, not when it becomes a serious problem for people who have already retired and are told after the fact that they will not be getting the real Medicare that they expected. Tell them now, when they're still not retired and have the choices of working longer or doing other things to adjust. I think it's unethical and immoral for a government, when confronted with these types of events, not to take action. What do we elect people for? What should the average American who owns a home be thinking right now? Should he be scared? Well, there is no question that there is an overhang of inventories, especially newly constructed, unoccupied single-family homes. I judge there are about 200,000 units that are excess. And at the rate we're going now, we're running off a very small number of these inventories a month. These units are going to overhang the structure and move prices inexorably lower. So I think we're going through a period that is not over yet, and it's important that we bring this to an end sooner rather than later, because it has a corrosive effect on the economy. Bill Gross at Pimco suggested bailing out homeowners. Would that be prudent? Is there anything that can be done? Well, you can, and as President Bush suggested, have a government-guaranteed organization like the Federal Housing Administration essentially guarantee loans and refinance them. That's a very difficult political decision, and it's a very expensive one if you do it in a wide-scale basis. I'm not sure where I come out on that one as yet. I've always been in favor of enhancing home ownership in this country, even though it is risky in the subprime area. I don't know where you draw the line, because a lot of the subprime lending has been frankly truly egregious and I think in many cases, criminal fraud. Is the great derivative blowup still to come? You've got to remember, there are derivatives and there are derivatives. I mean, corn futures is a derivative. Well, credit derivatives, esoteric ones. Credit derivatives are an extraordinarily valuable thing. What they do is move the credit from the initiator of the loans, which are highly leveraged financial institutions. They sell the credit risk to those with less leverage [who are] capable of absorbing losses. That's had a very positive effect on international financial systems, had a very positive effect on American banking. What you have to be careful about is collateral debt obligations, which have gotten much too sophisticated, are priced by extraordinary mathematical models, and are very difficult to value. I think people are going to be frightened to deal with those things for a long time. A lot of them are just going to disappear, because they've been tried; they don't work. But the big derivative markets continue to increase at a very rapid rate, and the reason is that they are important instruments for risk dispersion throughout the world. Is the Market Shock of '07 over? Do you communicate with Ben Bernanke and others at the Fed? On occasion, but I've tried to stay away from anything remotely discussing monetary policy. With the exception of going to the Fed barber who does my hair. He's got a very easy job - I don't have enough of it to make a difference. You seem to be much more at ease talking to me here, vs. your Senate testimony. Is it nice to be able to speak your mind? Yes. There's only one restriction that I'm involved in. I don't talk about what the Fed is doing. They have enough problems without somebody carping from history about what they're doing. Still, people have criticized you for speeches you give, saying, "Why doesn't he just shut up?" Well, I ask them, What would they like me to do? I have been looking at the world economy since 1948. That's my profession. Do they want me to become a logger or a brain surgeon? If I had been presented with a request that, yes, we would like to appoint you chairman of the Federal Reserve, but subsequent to your term you're not allowed to discuss anything about the economy, I would have turned it down. Is your wife, Andrea [Mitchell], happy that you're retired or does she find you just being a pain around the house? If I were around the house, I would be a pain. She may have experienced the extent of my retirement for a minute or two, because that's about as long as I was retired. Wall Street braces for Bernanke & Co.